Cloud subscription plans for 3D-capable cameras. Join us & capture the entire built world with Matterport. 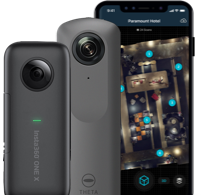 Matterport is happy to announce support for 360° cameras, including the Ricoh Theta V and the Insta360™ ONE X. This is the gold standard. There is no other professional 3D camera in its class. Matterport makes capturing, creating, and distributing beautiful, interactive 3D models easy and affordable. Matterport makes capturing every detail of a space lightning-fast and incredibly easy. Move scans to the Matterport 3D cloud, where they are automatically transformed into 3D models. Distribute your Matterport Model. Link, embed or publish it to Google Street View or MLS listings. With a single scan, get a complete suite of digital assets to help promote and run your business. Create an interactive 3D model with push-button simplicity and share across any connected device. Capture HDR-quality 2D photos that are perfect for online or print with your Matterport Pro2 camera. One scan with a Matterport camera provides 3D measurements of your space with 99% accuracy. Matterport exports to OBJ files for Autodesk Revit and is compatible with Xactimate. Automatically generate engaging animated gifs and video clips ready to share on social media. Regardless of your level of experience, Matterport makes it accessible and affordable to create interactive 3D experiences of real-world spaces.